Infowars and Watson have become a favorite source for President Donald Trump and his fans. The president and his aides have referred to Watson’s work during the campaign, and Jones claimed senior aides have said they “really want” Watson to be part of the White House press corps. Trump and his aides have helped mainstream Watson, Jones, and Infowars, which is aiming to get permanent White House press credentials. 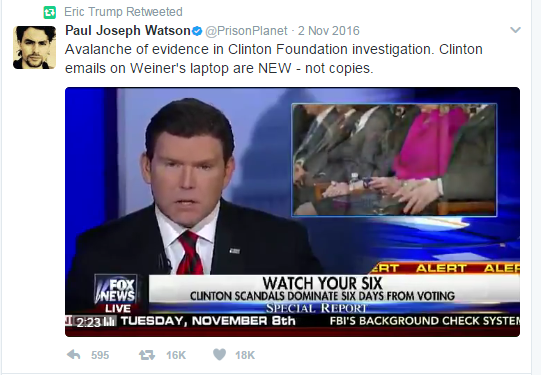 Trump has twice retweeted Watson’s account (Watson respondedto one retweet by writing that he “can now retire”). 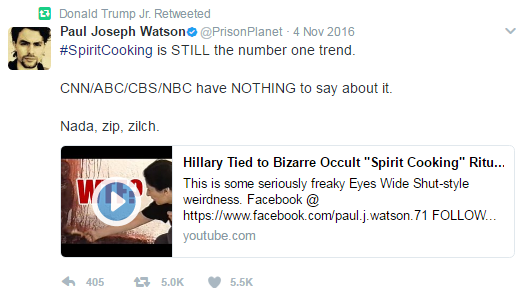 Donald Trump Jr. loves retweeting Watson’s account and has done so nearly 40 times since October 2016, according to the Trump Twitter Archive database. Longtime Trump adviser Roger Stone, Eric Trump, and White House director of social media Dan Scavino Jr. have also retweeted Watson or promoted his work. Jones said during a February 22 Reddit Ask Me Anything that he’s “talked to some of the senior Trump people” and they have told him, “‘Hey, we like you, but we really want Paul Watson’” as the Infowars White House correspondent. Jones added that Watson has declined to move to D.C.